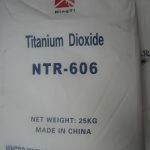 NTR-606 Super Durable Universal Rutile TiO2 Titanium Pigment High dispersibility; Super Durability; High Opacity; High-gloss finish; Stability; used Extensively in Paint, Coatings, Plastic, Ink and Paper. The test results show wide variation in how different TiO2 grades disperse following the various grind conditions while most pigments require the highest grind intensity ( 5 mins at 12m/s ) to achieve a clean dispersion ( >10 undispered particles ). NTR-606 achieves complete dispersion using less time and money. NTR-606 mixed in acrylic emulsion 20 mins at 1000 rpm. Undispersed particle count hits just over 100 compared to other competitors after mixing only 5 mins at 1.3 m/s tip speed.